Crimea: was it seized by Russia, or did Russia block its seizure by the U.S.? More recently, a poll of Crimeans was issued on 4 February 2015, by the polling organization GfK, and paid for this time by the pro-American-Government Canadian Government, via its Canada Fund for Local Initiatives, and via Free Crimea, which is itself funded by the latter organization. However, the Canadian Government got no better news than the U.S. Government had gotten: 82% of Crimeans “Fully endorse” Crimea’s having become part of Russia (of which it had been part between 1783 and 1954, and which the public there had never wanted to leave); 11% “Mostly endorse” it; 2% “Mostly disapprove”; 3% “Don’t know”; and only 2% “Fully disapprove.” Or, to put it simply: 93% approve; 3% don’t know, and 4% disapprove. This poll was publicly issued only in the polling organization’s own report, which was made available only in Russian (the Ukrainian Government’s main language for international business) and therefore not comprehensible to English-speakers. It was titled, “СОЦИАЛЬНО-ПОЛИТИЧЕСКИЕ НАСТРОЕНИЯ ЖИТЕЛЕЙ КРЫМА Исследование проведенное GfK Ukraine по заказу компании” or “SOCIO-POLITICAL SENTIMENTS IN CRIMEA: Research conducted by GfK Ukraine on the order of the company.” On February 10th, an English-language article reported and summarized the poll’s findings. An accurate reflection of the reason why Crimeans, during the lead-up to the referendum, were appalled by America’s extremely violent and bloody takeover of the Ukrainian Government (as the EU itself had confirmed), was given on Crimean television shortly before the referendum, when a former criminal prosecutor in the Ukrainian Government, who lived and worked in Kiev and saw with her own eyes much of the violence but was not personally involved in the events, quit her office, and got in her car and drove back to her childhood home in Crimea, now unemployed, because she was so revulsed at what had happened to her country. On this call-in show, which was watched by many Ukrainians, she explained why she could no longer, as a lawyer and a supporter of the Ukrainian Constitution, support the Ukrainain Government — that it was now an illegal Government. She closed her opening statement, just before taking the calls from people over the phone, by saying, “Despite that our ‘great politicians’ who seized power by bloodshed, are now claiming that we don’t have the right to decide our own future — citizens of Crimea, you have every right in the world. Nobody is allowed to usurp power.” She subsequently became a criminal prosecutor in the new Crimean government, enforcing now the Russian Constitution, in Crimea. However, anyone who says that Russia “seized Crimea,” is clearly lying or else is fooled by people who are. Nothing was said about the Black Sea fleet, nor about any strategic issue. Nothing was provided in order to help readers understand what was happening. Readers’ Cold-War buttons were being pushed; that is all. America’s aristocracy despises its public, whom they merely manipulate and control. And, here is the best video that has yet been issued on Obama’s February 2014 coup, the coup that installed the Ukrainian regime that has been carrying out the ethnic cleansing operation, which Ukraine calls their ‘Anti Terrorist Operation,’ in the Donbass region, though it’s really the anti-resident operation there. 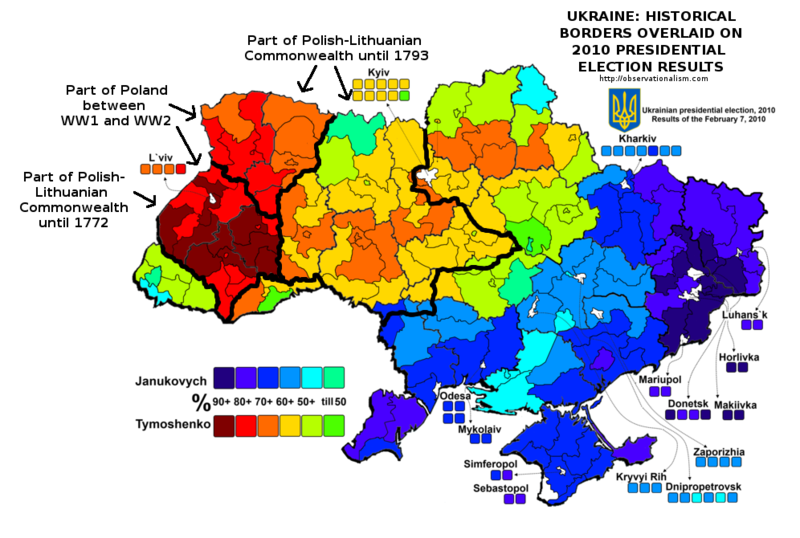 That fate of ethnic cleansing or local genocide — the fate which befell the residents of Ukraine’s Donbass region, the region that’s shown in dark purple in this election-map for the man whom Obama overthrew in February 2014 and which is the area that voted 90% for him — is the fate that Crimeans were protected from when they rejoined Russia. Russia’s using its troops, who were permanently stationed in Crimea already and didn’t need to ‘invade’ anything in order to protect the residents in Crimea so that they could hold their referendum in peace, is what blocked the seizure of Crimea by the newly installed Ukrainian regime. The invader was the United States, in its typically sneaky post-1950 way: a coup d’etat. What Dwight Eisenhower’s, Allen Dulles’s, and Kermit Roosevelt’s CIA operation had done to Iran in 1953, Barack Obama’s and Victoria Nuland’s operation did to Ukraine in 2014: a violent coup installing a far-right government — in Obama’s case, even a nazi government (and see this and this and this). That — and the firebombings and other horrors that Washington’s Brookings Institution think tank want U.S. taxpayers to finance yet more of in Donbass — is what RussiaprotectedCrimeans from. The aggressor here is not Vladimir Putin; it is Barack Obama. All honest news media (such as here and here and here and here and here and here and here) are reporting that. For economic analysis and reporting on these and other events, here is an excellent general news source. (It autotranslates if viewed in google’s chrome browser.) As for dishonest ‘news’ media, such as TIME and Fox ‘News,’ they serve a different purpose than truth; so, none of them will be listed here, where the only interest is truth. PS: For further insights into the lying that is prevalent in the West regarding Crimea, Ukraine, and Russia, see this remarkably honest testimony to the U.K. House of Lords’ 20 February 2015 Committee report, “The EU and Russia: before and beyond the crisis in Ukraine,” linked there on p. 108 as “RUS0012” and titled “Irina Kirillova MBE – Written evidence,” in which that Cambridge university professor describes the profound disappointment of ordinary people she had encountered in Russia, as they saw the misrepresentations in the West regarding the situations in Russia, Ukraine and Crimea. Outside of the English-speaking world, and especially in the regions that are not controlled by the U.S., the fakery of ‘journalism’ in the English-speaking world is becoming shockingly more evident than it formerly was. As usual, however, the House of Lords’ final report ignored these realities; and, throughout, it starts with the assumption that Russia is aggressive and that the West is merely responding to that. This professor’s written testimony was thus ignored. Most of the other individuals in the “Appendix 2: List of Witnesses” were the Anglo-aristocracy’s usual Russia-haters, such as Ian Bond, Director of Foreign Policy, Center for European Reform, saying that, “The most important thing is that the EU, as a rules-based organisation, should follow a rules-based approach to Russia,” as if that would be something alien to Russians. This type of bigoted condescenscion was rife throughout the report. If those people are as blind to evidence and science as they put themselves forth as being, they are dangerous in any governmental role; and to call the U.K. a ‘democracy’ is questionable, at best. Britain is an aristocracy, not a democracy. And the U.S. is at least as bad. In regards to the relationships between Russia, Ukraine, and Crimea, the West might be as bad as Ukraine, and should just quit the entire matter and try to start over from scratch, which means to let the nazis whom Obama placed into power there sink, not provide them with more weapons. Or, if more weapons are provided to them, then the rest of the West should issue sanctions against any nation that does that. Under liars and fools the West is drifting towards a totally unwarranted nuclear conflict with Russia.